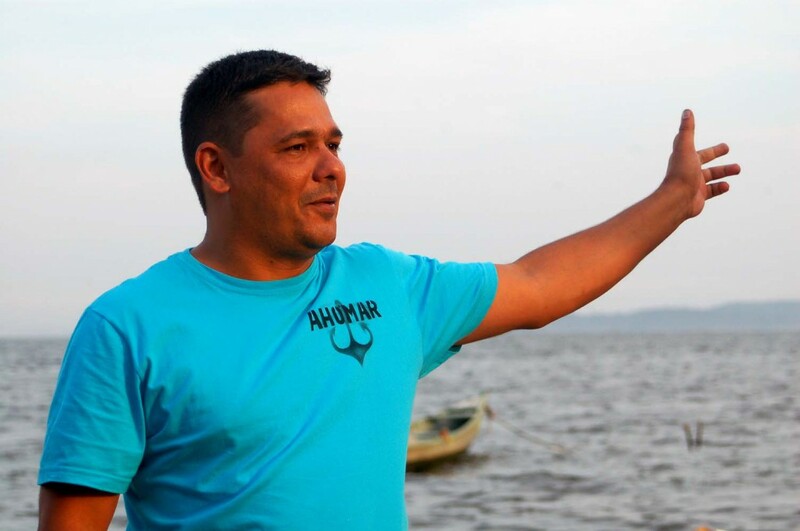 Alexandre Anderson de Souza is the Director of the Association of Men and Women of the Sea (Associação Homens e Mulheres do Mar – AHOMAR), a fishers union in struggle against the social and environmental impacts created by PAC investments rendering fishing nearly impossible in the Guanabara Bay. AHOMAR represents artisan fishers from seven municipalities in the Guanabara Bay and has 1,720 founding partners. Since 2007, they have systematically denounced the crimes and rights violations which occurred during the construction of the petrochemical complex, COMPERJ. In 2009, the men and women of AHOMAR occupied the construction sites on land and sub-sea gas pipelines for transport of Liquid Natural Gas (LNG) and Liquefied Petroleum Gas (LPG), built by a consortium between two contractors: GDK and Oceânica, both hired by Petrobras. The fishers anchored their boats close to the pipelines and resisted for 38 days. Since then, fishers from AHOMAR have suffered constant death threats. That same year, in May, Paulo Santos Souza, formerly in charge of the association’s accounting, was brutally beaten in front of his family and killed with five shots to the head. In 2010, another AHOMAR founder, Márcio Amaro, was also murdered at his home in front of his mother and wife. Both crimes have never been brought to trial.